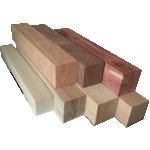 Our 2x2x12 and 1.5x1.5x12 inch Hardwood Blanks are prefect for Wood Turning, Carving, or Compound Cutting. We carry 2x2x12 and 1.5x1.5x12 blocks in a variety of hardwoods. They work great for cutting compound creations on the scroll saw, like chess pieces and Christmas ornaments. Also for turning projects on the lathe and much much more. Longer lengths are available, contact us for prices.